I was searching for the best Pau recipe that suits my taste until this one came along in Mama Fami's fp. This was the second recipe that I had tried. The result was not disappointing. It was really spongy, elastic and bite able. And Yes Cik Mat Gebu it has skin!. Will use this recipe next time for sure. What I learned from this was not to double rack the steamer. Only steam one layer of rack at a time. Other wise, the top rack will not cook properly. Sorry kak aniza and family... hehehe.. saya budak baru belajar... While making the pau, we were chatting with kak myza. To kak myza, this is the recipe that you asked. It so easy, I think your children will like it. Kaya or red bean paste or chicken / beef curry... so flexible. Sift flour, bread improver and baking powder into the mixing bowl. Add in yeast, sugar, ovalette and mix well. On the mixer and pour in water, a little at a time till well incorporated then add in the vegetable shortening. Continue kneading till a smooth and soft dough is formed. Add more water if needed. Make into small balls and place the filling in the middle. Leave the dough to rest and rise for 20 - 25 minutes. 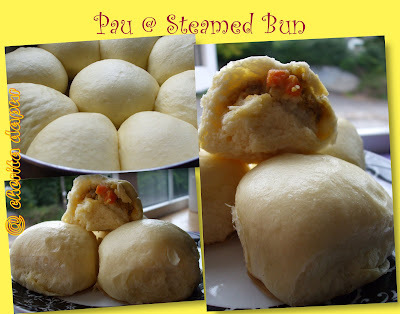 Get the steamer ready and steam the pau for 8 - 10 minutes. There are optional natural colourings - Carrot juice for yellow and pandan juice for green.